The marriage of technology and normal, everyday appliances may hold lots of promise, though in practice these ambitious mergers have sometimes produced complications. Still, engineers are hard at it, and in Las Vegas this week, at the 2017 Consumer Electronics Show (CES), LG has unveiled perhaps its most ambitious kitchen appliance yet – the LG Smart InstaView refrigerator. The appliance comes complete with with an array of technology features provided by Amazon's Alexa Voice Service and powered by LG's proprietary webOS smart platform. One of the unique features is the Door-in-Door concept, based on a 29-inch touch LCD display. With two knocks on the screen, the glass turns transparent to allow a user to look inside without opening the door. When the screen reverts to its normal LCD state, a WiFi-enabled features allow users to create a streamlined food management system that resides on the door. Users can add stickers and tags on the screen to keep track of which foods are stored and their expiration dates. The refrigerator will issue reminders when an expiration date approaches. But that's not all. Amazon Alexa is also embedded in the electronics, providing a kitchen helper that can find a recipe, place Prime-eligible food orders from Amazon.com, assemble a shopping list, and even play tunes to entertain the chef. 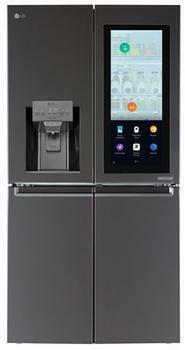 "By working with Amazon, we are able to broaden LG's Smart InstaView refrigerator's capabilities and provide consumers with a new smart home service that enhances the at-home cooking and dining experience," said Song Dae-Hyun, president of LG's and Home Appliance & Air Solutions Company. "Our newest innovation will allow users to enjoy their kitchens like never before with new abilities to 'speak' to the fridge, control the home's connected devices and connect with the family in a new way." The Smart InstaView may be just the latest bold step in connected homes, but consumers going in this direction should remember that all connected devices can be vulnerable to hacking. It is important to understand how the manufacturer has designed in safeguards.